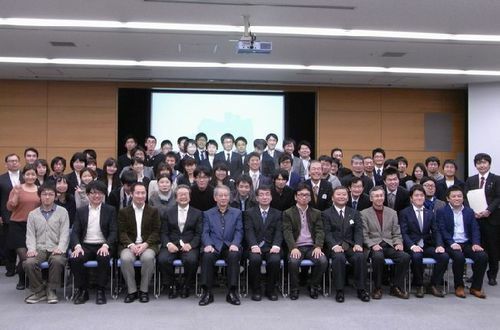 The final presentation of the students of the Fukushima Reconstruction Juku (Japanese word study program), a leadership program to train future generations to take part in the reconstruction process of Fukushima after the Great East Japan Earthquake of March 2011, was held on December 14, 2013, in Koriyama City, Fukushima Prefecture. As an accomplishment of the eight-month class offered from May 2013, the first generation of students gave presentations on projects that will lead to reconstruction of the prefecture. Many of the projects deal with local issues relating to different stages of reconstruction, which include the restoration of agriculture and food that have been damaged by harmful rumors regarding radiation contamination risks following the nuclear accident triggered by the earthquake and tsunami, the health of children and elderly people and the pursuit of happiness through manual work. The 25 students, mainly in their 20's and 30's, divided up into small groups, studied under the challenging program on business planning taught by leading businessmen. The students visited Chernobyl and met with people who have been working on reconstruction since the nuclear accident in order to learn global and historic views as a prelude to project planning. Seeing first hand that decommissioning of the wrecked nuclear plant has been nearly stalled for 27 years, the students realized that Fukushima's reconstruction requires long-term commitment and considered this when planning their projects. Looking back, the organizer Tatsunori Sato, says that instructors and mentors gave students personal coaching to enable them to brush up their project plans and improve their capabilities. The program will be offered again in fiscal 2014.